After a gap of some years Indian athletics can look back on an international competition with a sense of achievement. The Asian championships in Fukuoka could indeed be termed as a new beginning for the sport in India. Legends they say never fade, they only become better like old wine. One such legend is that of P.T. Usha, the face of Indian athletics, who has proved beyond any doubt that she is of one of the best things to have happened to the entire Indian sporting scenario. THE Indian Tabacco Company has taken a giant step forward to help promote golf in the country. Already sponsors for the Indian Open, perhaps the most prestigious competition in the country, the ITC will now sponsor Indian Tour on the lines of Omega Tour in the Asian circuit. After a gap of some years Indian athletics can look back on an international competition with a sense of achievement. The Asian championships in Fukuoka could indeed be termed as a new beginning for the sport in India. It was not because of the medal intake. A tally of one gold, three silver and eight bronze is hardly the picking one expects from a country which in the early years of the Asian championships played a near dominant role. The most important aspect of the recent competition is that after a long time one can confidently claim that Indian athletes are no longer just training-fit. They are also competition-fit. What is more important is that for the first time the men and women performed with a great deal of confidence. There was no question of any pre-race nerves for some of them and at the same time there appeared to be an awareness of the quality of the opposition. Thus the athletes, most of them, knew where they would stand even if they performed their best. Once this realisation had set in there was nothing to prevent them from putting everything into their events. Thus medals alone was not the main target. performance was given priority. And that is why the competition in Fukuoka gains in importance. Contrary to earlier meets, most of the athletes performed as well and in some cases better than their rating at home. There is one more reason for the Indians to jubilate. There was the presence of P.T. Usha in what can be termed as her second coming. No one expected her to perform any miracles but for an athlete into her mid-thirties and who has practically muscled herself back into reckoning not only as a part of a scheme but in the forefront of the troops to play the leading role, Usha is something extraordinary. Just imagine an athlete on a comeback trail in a competition where some of the younger lot were born around the time she first set food on the track. Little wonder than that there were quite a few among the spectators in Fukuoka who had doubts whether the Usha competing in championships was the same P.T. Usha who began her career 20 years ago. But time was only another hurdle for this great athlete who on the very first day earned a right to run in the final of the 400m by winning her semifinal in 53.33 sec, for slower than her own best of 51.61 sec of the Canberra World Cup vintage (1985). The next day she picked up a medal in this event, a bronze though but it was indeed a great start for an athlete taking part in a major international competition after a long lay-off. The more important aspect of Ushas performance was that she cut down on her semifinal timing drastically, now clocking 52.56 sec. The next item on the agenda was the 200 and Usha topped the list of qualifiers with a time of 23.27 sec, a performance which equalled her best, set in the Delhi edition of the competition in 1989. She was to repeat this time in the final but it was not good enough to earn her a gold. She had to be content with a bronze, the race being won by an inspired Yan Jiankui of China who was no a hunt for a sprint double. Fortune always smiles on the brave and it did so on P.T. Usha and India as the relay squad of the 4x100m with the Kerala Express as the anchor claimed the gold medal after the Chinese had forfeited their right despite winning because the blunder in the baton changing zone. The conversion of the silver into gold was a boon for India. What is more India had never won the gold in this event even when Usha was at the top. Usha, however, could have wished for a gold in the 4x100m relay, once a pet theme for the Indians but here the Chinese made no mistake, keeping to their winning ways. The Indian relay teams had every reason to be happy with the way they had performed. Usha anchored both races and in each the other girls had played their part to perfection. If it was Saraswati Dey, Rachita Mistry and E.B. Shyla in the shorter race, the role was equally well done by M.K. Asha, Rosa Kutty and Jyotirmoyee Sikdar in the 1,600m. And if Usha ended the competition with one gold, one silver and two bronze, Jyotirmoyee Sikdar was only fractionally behind, winning one silver and two bronze, the medals coming in the 1600m relay, the 1500m and the 800m. Certainly one can look forward to a better effort from her in the Bangkok Asian Games. The saga of P.T. Usha is thus again on the upswing, the more important target being the Asian Games in Bangkok. Usha herself kept saying that her main competition would be Bangkok and considering her showing in the 200m and the possible improvement in the 400m, the athlete is bound to keep Indias flag flying there in December. The story of the competition in Fukuoka would not be complete without delving into some of the other performers, two of them who in fact could be said to have done on a scale better even then Usha. There was the fine showing of Paramjit Singh, the quarter-miler who anchored India to a national record time in the 1,600m relay, a performance which nevertheless did not fetch India a medal. Paramjit, however, was destined to be involved in what turned out to be the fastest 400m run in a competition among Asian athletes. The Punjab man ran a sub-46, the first Indian to do so after Milkha Singh and still finished fifth, the winner, Sugath Tilakeratne of Sri Lanka coming home in 44.61. The fact that the first five athletes came under 46 sec is a testimony to the blistering pace set by the front runners. Paramjit Singh may not have won a medal but he was a part of a race which will be talked about for quite some years. Then there was the diminutive Gulab Chand, striving and succeeding for his first medal in international competition at the senior level. He had hit the headlines as a junior in the Asian meet in Delhi but now, a matured athlete, he ran brilliantly against some top competitors from the continent to claim a silver, clocking a career best of 13.55.40, becoming only the third Indian after Raj Kumar and Bahadur Prasad to come under 14 minutes for the distance. 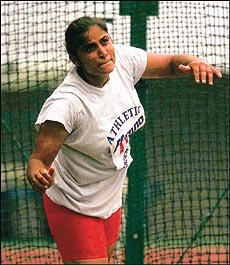 For Neelam J. Singh this was an opportunity to assess her qualifications to be the best woman discus thrower after the Chinese in the Asian continent. She did well enough to claim a silver with a throw of 56.81m. She has of course thrown beyond 57m but the Chinese winner has a record throw which measures even better. Thus Neelam should not have any regrets. Of the other Ajit Bhaduria, winner of discus in 1993, had to be satisfied with a 55.46m throw which earned him a bronze, certainly better than fifth placed Shakti Singh whose national record stands at 61.72m but that has been the only time he crossed 60m. Shakti, however, had the consolation of picking up a bronze in the shot put, another event in which he holds the national record. His throw of 18.40m was way behind his best of 19.08m. Women javelin thrower Gurmeet Kaur should be overjoyed as she threw past the national record while claiming a bronze. Her throw measured 55.35m, an improvement by over 2m on her personal best of 53.08m. 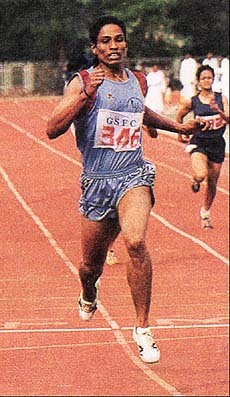 Bobby Aloysius was another athlete who took the opportunity of improving upon the national mark but her effort did not merit a medal in this high class competition. Bobby jumped 1.85m to finish fourth in the high jump, but had the satisfaction of bettering her own best of 1.80m. Quite a substantial leap. Fukuoka is over and done with. The next step is the Asian Games in Bangkok. The athletes have over four months to sustain their form and be prepared to peak at the right time. Bangkok could well be the take-off point for another era of prosperity in athletics for India. Hers is a story of rise and fall and rise again. Just when her critics had dismissed her and her fellow athletes had scoffed at her for the umpteenth time, the Payyoli Express did not let her steam run out and proved her detractors wrong by doing the one thing she does best- winning. In one of the most memorable comebacks, 33-year-old P.T. Usha defied all odds and predictions to win a gold in the 4 x 100 m relay, silver in the 4 x 400 m relay and bronze in 200 m and 400 m, at the recently concluded Asian Track and Field (ATF) meet at Fukuoka, Japan. No wonder then that competitors asked in disbelief at the meet whether it was the same Usha! The P.T. Usha saga began in 1982 when she first blazed the tracks at the Asian Games in New Delhi, winning the silver in the 100 m and 200 m. There was no looking back after that and she went from strength to strength leaving a mark on Asian tracks. At the Kuwait ATF meet in 1983 she won the gold in her favourite 400 m and the silver in the 200 m. There was disappointment, however, at the Los Angeles Olympics next year when she missed the bronze in the 400 m by a whisker - 0.01 sec. But she was back with a bang at the 1985 Jakarta ATF meet, one of the highlights of her career, where she won medals in the 100 m, 200 m, 400 m, 400 m hurdles, 4 x 100 m and 4 x 400 m relays. At the Canberra World Cup later that year she ran the fastest 400 m by an Asian woman. The golden girl was to give another superb performance next year. The 1986 Asiad in Seoul remains hers and Indian athletics crowning glory. Usha bagged four gold- 200 m, 400 m, 400 m hurdles and 4 x 400 m relay and the silver in the 100 m.
At the Singapore ATF meet in 1987 she won gold in 400 m, 400 m hurdles and the 4 x 400 m relay. But a medal at the Olympics, in Seoul next year, remained a distant dream and she lost in the first round of the 400 m hurdles. That was the beginning of her decline, chiefly due to a system that banks on an individual till he/she can give no more and is unceremoniously dumped. Usha, however, is made of sterner stuff and time and again comes back to defy odds. Taking the failures of earlier meets in her stride she came back to retain her titles by winning the gold in the 400 m, 400 m hurdles and 4 x 400 m relay at the New Delhi ATF meet in 1989. She even won the 200 m gold, in the process setting a national record for her timing of 23.37 sec. which still stands. But post 1990, though the mind and spirits were willing to reach out for more stars, the body needed rest. Usha had been on the top for nearly a decade and was beginning to show signs of fatigue. In the Beijing Asiad she failed to win an individual medal and retired after that setback. She tied the nuptial knot in 1991 with kabaddi player Sreenivasan and had a son. But the tracks beckoned her once again and Usha was back in the limelight. Her international comeback was at the 1994-Hiroshima Asian Games where she finished fourth in the 200 m. At the Atlanta Olympics in 1996 she just ran the relays. But gradually the timing improved and the rhythm returned. Today the body shows no sign of rust and is as charged up as her mind, raring to go and conquer new tracks and blaze old ones. Though she is not the P.T. Usha of yore she is once again our best hope for the December Asian Games. It is, however, a sad reflection on our system that has not been able to produce more Ushas. But that only goes to show the extraordinary will power this gifted athlete has to excel. Pulavulakandi Thekeperempil Usha, the shy, dusky lass with a long name from the backwaters of Kerala, has sure come a long, long way. The saga began 20 years ago... and the saga continues. THE Indian Tabacco Company (ITC) has taken a giant step forward to help promote golf in the country. Already sponsors for the Indian Open, perhaps the most prestigious competition in the country, the ITC will now sponsor Indian Tour on the lines of Omega Tour in the Asian circuit. The Indian golfers and also promoters feel that it is a positive step which will help provide much-needed exposure to the Indian golfers, particularly caddy-turned-professionals, to develop their mental sharpness. Golf is in the mind and merely played with hands through the prescribed 14 clubs. If the mind is alert and at rest, the game improves; if the mind is uneasy and disturbed, play suffers and even simple shots are muffed. When the Indian Open was initiated more than two decades ago the competition was to rotate between Calcutta and Delhi. In 1991, a Sher rose from among the caddies to become the first Indian caddy-professionals to win the Indian Open at Delhi. Sher proved that he was the sher as he retained the title in 1993. He became the first Indian to win the title twice. Since then, Ali Sher has actually been in the wilderness. Is he to blame for his failure to improve? Maybe yes because he has failed to grasp the opportunity to perform creditably in competitions abroad. Maybe, no, because the authorities, particularly those stationed at Delhi, have not taken effective measures to help him develop his mental faculties. No matter how skilful a player may be, he has to make complete and decisive use of his mental faculties to outwit and outsmart opposition abroad. Since 1993, the Indian Open has been held only at Calcutta. The reasons offered by the sponsors are that there is total ban on tobacco advertisements in Delhi and hence the sponsors will not get sufficient mileage out of the meet. This is a flimsy argument. The sponsors are smart enough to circumvent any rule. If sponsors decide to run a competition, they know how to conduct it and if they decide not to run it they will have hundreds of excuses to back out of it. Golf in this country may have begun in Calcutta. But the game has to spread throughout the country. Maybe, apart from Calcutta and Delhi, Indian open is played at Mumbai and Bangalore. Why not? The wider the umbrella of organisation, the better will if be for the game. The sponsors, ITC, are a seasoned campaigners in golf. They are backed by Tiger Sports, which is headed by Ashok Malik, five-time national amateur champion. It is not understood why Wills Masters is scheduled for August 5 to 8. It is a peak rainy season. It will be a sheer providence if rain does not play the role of spoilsport. It will be sheer unfortunate if the opener of the season is interfered by inclement weather. The Classic Golf course at Gurgaon is in a marvellous condition. It is perhaps the best in this region. But the distance is killing. It takes a good 70 to 90 minutes to reach from the course any spot in Delhi. The approach road is still to be fully developed. It indeed has many facilities. The course is fit enough to hold any competition. Maybe, the Indian Open will be held there one of these years. But it will be a nightmare for participants and mediapersons to go through this tough exercise. A keen golfer suggested the other day that the authorities should develop a helipad around the course to fly players from Delhi to the course so that star participants in the main competitions are able to play to their potential and skill instead of being worn out through hazardous car drive. Since the authorities are spending so much money, why not develop a helipad for the use of the foreign and other renowned Indian players? Delhi Golf Club showed a lot of imagination in installing a giant screen to telecast World Masters Golf the other day. The idea caught on. Many golfers, young and not so young, had the spirited view of golf of the highest order. We all enjoyed it, said three veteran golfers, adding: It was a great fun watching vividly Tiger Woods and others in action. In view of the success achieved in this direction, the club may install a giant screen for important competitions held on the course. Maybe, this will be one of the measures to help promote golf in the capital. Maybe, the electronic media will jump into the fray. EARLIER in Indian sport, there were no steroids, no million dollar contracts and more significantly no super coaches (read foreign coaches). But then how times change. Now, over the years, Indian sport has become a spineless system (read SAI and IOA) which refuses to deliver the goods. A system where after every reversal, committees are set up which prepare post-mortem reports and which conveniently are swept under the carpet. And more importantly it has become a system which has no faith in the coaches it itself has produced due to which it is more content on spending millions on roping in unknown quality foreign coaches. Commented a two time Olympian: These coaches are those who have been rejected by obscure systems. Do we really need these coaches?. More importantly roping in these coaches and that also for a couple of months, is like administering glucose to a patient who is already clinically dead. Under the Rajkumari Amrit Kaur Scheme - launched in 1961 - a policy was framed to make optimum use of renowned Olympians and other international sportspersons. But for some inexplicable reason the policy was abandoned and subsequently more faith is now being placed on foreign coaches. And, unfortunately, no set criteria has been evolved in importing these coaches. It is just a pick and choose sort of a thing. Again in 1970, a new policy was formulated under which many coaches were sent to the GDR and USA so as to update their knowledge and to keep them abreast with the latest changes in the art of imparting training. At present SAI has on its contract hordes of foreign coaches, one GTMT expert, one doctor and one masseur. And SAI will be doling out a cool 26 million rupees on their upkeep - medal or no medal - for their is no clause in their contracts which makes them accountable. Most of these coaches are here till the Bangkok Asian Games. Once the games are over they will be catching the first flight home and it will be the India coaches who will bear the brunt of criticism. And this is the common consensus among Indian coaches who are attached with various Indian teams here at the NIS. The problem is that our sportspersons are simply not receptive to whatever ideas are put forward by these foreign coaches. The problem is when these coaches are roped in, it is the Indian coach who feels rejected by the very system which produced him in the first place. And the problem is when these coaches go back, they leave behind a trail of rejection and disillusionment, which is very much visible, among Indian coaches, some of whom are exceptionally brilliant in their own fields and have proved themselves. Among the Indian coaches who were sent abroad, only the chief national boxing coach is handling the national squad. All others can be found doing everything except coaching. G.S. Sandhu has given us some good results and three of his trainees  Dingko Singh, Harpal Singh and Gurcharan Singh, among others  are sure medal prospects for the Asian Games. Talk of Indian coaches and the conversation veers around to Pal Singh Sandhu, chief national weightlifting coach for women. Coach Sandhu has done the country proud by producing some world class women weightlifters among them being K. Malleshwari and Kunja Rani. Lack of communication skills between our athletes and the foreign coaches is all too evident here at the NIS. Sample this: A Russian throwing coach has been roped in to train Indian throwers. He claims to have produced two world class throwers. Admitted. But that was way back during the 1980 Moscow Olympics, where due to a USA-led boycott, some top athletes never made it. From Moscow till now 18 long years have passed and whatever training methods the Russian might be imparting to our throwers have been consigned to the archives. This is unless the Russian coach has been in touch with wheels of change in the world of sport all these 18 years. While still on the communication gap, this one example would be enough to throw some light on this aspect. During the national camp here at the NIS, the Russian throwing coach Aleksie Ivanov was seen explaining to a top Indian thrower, a fault in his technique due to which the discus would bubble in mid air, because of which the wind acted as a wall as a result of which the distance of the throw was not increasing. Ivanov spent three training sessions, mostly using sign language, trying to get the fault rectified. It is a 10 second job whispered an Indian coach to this correspondent. The coach called the thrower aside and again whispered something in the throwers ear. Result: The throwers next five successive throws were near perfect and the discus stopped bubbling. Who won the round-obviously the Indian coach. The three-star treatment meted out to these coaches has left a lot of heart burning among the Indian coaches. First let us consider the financial component. What is Illyas Babar, who is also on contract with SAI getting as compared to Aleksie Ivanov? Peanuts. While Ivanov is getting a monthly salary of $ 2500 (Rs 1 lakh approximately) and the total expenditure to be incurred on him by the government comes to a whopping Rs 19.25 lakh, Illyas Babar has been contracted for just Rs 10,00 per month. And Illyas Babar, considered to be a legend in motivating athletes, has been bestowed upon with the Dronacharya Award. Now let us have a glimpse on the pampered treatment these coaches get. One day, during the national hockey camp here at the NIS, our national coach Vasudev Baskaran could be seen frantically waving his hands and seemed to be a man ready to explode. Reason: Swarms of mosquitoes were flying in formation in front of Baskarans face. Forget that the man has led us to an Olympic gold. Also forget that the man is a Padam Shree. All foreign coaches have air-conditioners and coloured TVs in their rooms. In sweltering heat Baskaran had none. Only a cooler. Forget the TV. Gurbachan Singh Randhawa, who won the gold in the decathlon in the 1962 Asian Games says: Why all this hype over foreign coaches? We have some brilliant coaches and half the medals we won in the 1982 Asian Games were due to the efforts of J.S. Saini and Sriram Singh. If at all there is a necessity these coaches should be given at least a tenure of four years. But nearly all foreign coaches are on contract with SAI for a maximum of one year. And in some cases, as in shooting, coaches have been contracted only for a couple of weeks. For the 1982 Asian Games we had a foreign coach for gymnastics and swimming. Results: No medal in either of the disciplines. And at that time the maximum medals we won were in athletics. And that was due to the efforts of the then national coach J.S. Saini, who is no foreigner at all. And former national athletics coach J.S. Saini hits the nail on the head when he says: When these foreign coaches come, who in any case are not world class as they are made out to be, we are driven like cows by officials. Is SAI or IOA listening?